"My Missal! My Missal! Where is it? I can't seem to find it? Who the hell can do such an atrocious thing to me? May the wrath of the Blessed Mother be upon him! How am I going to find what sermon to read from the Bible? It's not like I can go in front of the masses and give a word from it. I haven't been trained for that." Eventually the Missal was found hidden under a velvet rug in the Vatican's dining area. Someone had also hidden the golden goblet which the Pontiff uses to celebrate Mass. Because of the incident, Mass was delayed by fifteen minutes. 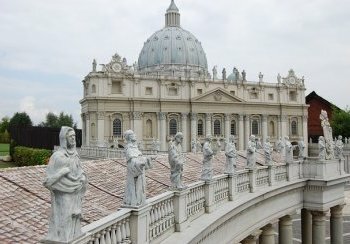 Further reports stated that it was apparent that the person or persons who had hidden the expensive items had probably intended to smuggle it out of the Vatican in order to sell it. So far no one has come forward to confess to the wrong deed. "What happened here this morning was despicable. The culprit or culprits who were responsible for this sinful deed must come forward now and confess their sin to me so that I can forgive them because Jesus has given me the authority to forgive sins in accordance with John 20:23. He has also given me the authority to allow people to remain in their sins; in accordance with John 20:23. Right now their salvation is in my hands. And seeing that no one has come forward as yet, may hell be that person's fate. He is not even worthy enough to go to purgatory." The Pontiff concluded though that there will be a full investigation by the Vatican Police to find out who was responsible for what happened and that the person or persons will be punished accordingly as Saint Francis of Assisi and the Virgin Mary instructs him. I'm sure I've read plenty of horrendously terrible pieces of work in my life but this makes me sweat blood. What a waste of everyone's time, effort and energy.